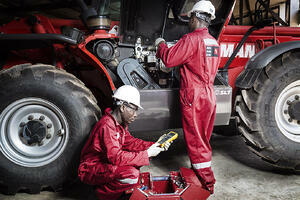 Paterson Simons is the leading supplier of world-class crane and heavy lifting brands in West Africa. For more than 70 years, Paterson Simons has provided sales, parts and services specializing in crane, reach stacker, telehandler and forklift throughout West Africa. As the official dealer for Manitowoc, Konecranes, Manitou and Terberg tractors, the U.K.-based company has developed an international presence and expansive territory coverage. 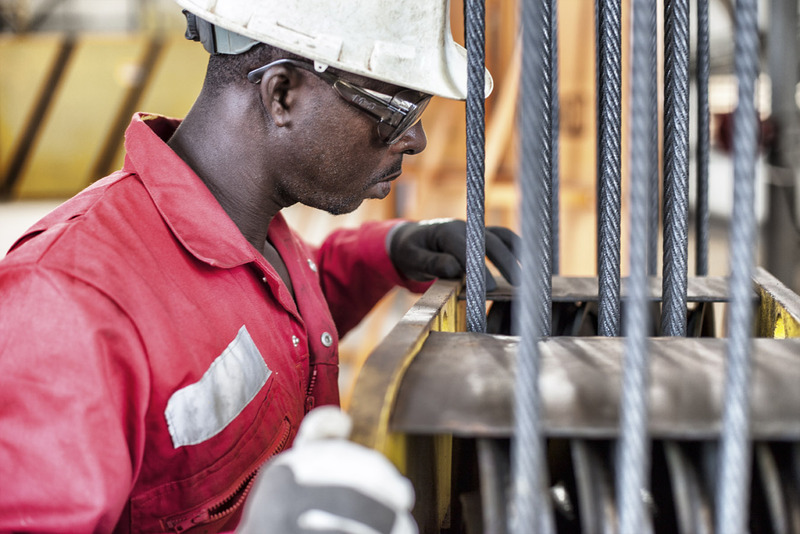 Thanks to their expertise in heavy lifting, as well as their extensive service network, Paterson Simons supports suppliers and consumers in the mining, ports, and oil and gas sectors throughout the West African region. 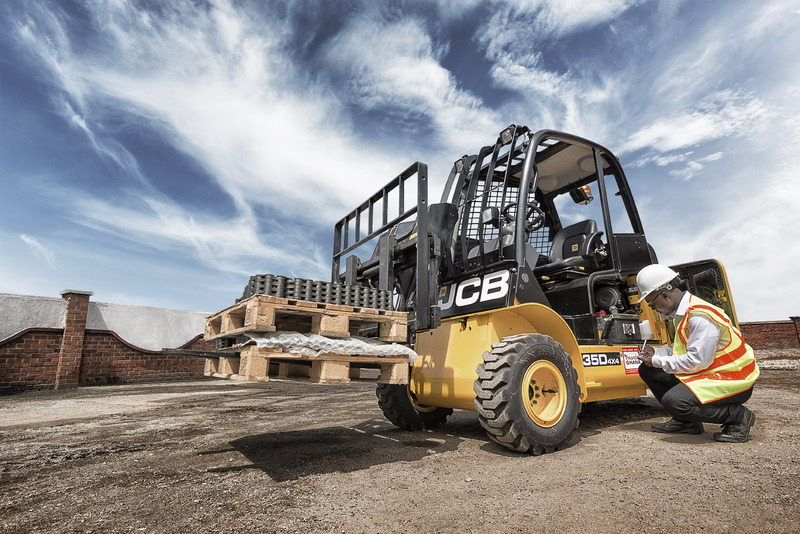 Historically, the company has relied on paper-based field service reports for completing equipment inspections and invoicing customers for services or repairs. However, this reporting style resulted in processing delays and transcription errors, affecting business overall. In order to develop scalable data transmission processes, optimize invoicing procedures and modernize billing and reporting, something had to change. 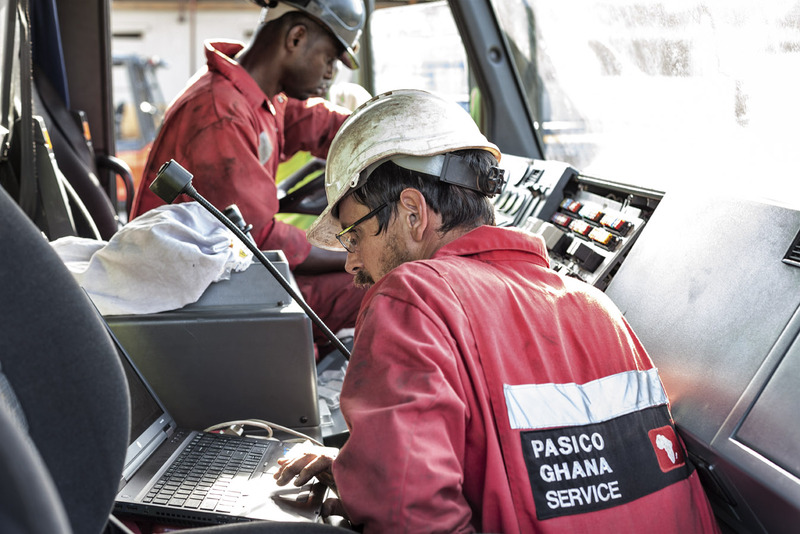 When Paterson Simons technicians were traveling from their base in Ghana to work on mining sites in Guinea, for example, it would take up to four weeks for their handwritten field service reports to arrive back at the office. What’s more, paper-based reports were often illegible, prone to human error and slow to process. Combined, these obstacles made completing repairs, processing invoices and making part orders impossible until the physically signed documents reached the office. “Having a phone app has really changed things quite dramatically. We can now, at the touch of a button on-site, actually complete a report,” Traynor explains. Device Magic’s offline capabilities have allowed technicians to gather information in real time and automatically send reports to the office upon re-establishing a connection. Using mobile data collection, Paterson Simons has been able to cut their billing process from weeks to mere minutes. Initially, Paterson Simons set out to improve document presentation while alleviating the administrative time spent on creating reports. Coupled with this was the long-standing challenge of finding an efficient way to receive and resize machinery photographs often emailed by remote technicians. “We really just started by thinking: ‘How can we collect some photos in an easy way that enables us to have an admin in an office sit down and produce some more professional reports?’” Traynor explains. Device Magic’s app enables field service technicians to capture an image or select one from their mobile device gallery—automatically adjusting the image size to fit their predetermined Destination, such as a Word document. For Paterson Simons, having the ability to share images from job sites with customers has been a huge benefit, allowing them to effectively convey the data they’ve gathered. “If we report on a handwritten field service report that a hoist rope is rusty, it doesn't have much of an impact. But if you show a picture of a rusty hoist rope, it’s almost criminal not to replace it,” Traynor adds. The ability to show the status of a crane through images has an enormous impact on the customer’s understanding of the necessary equipment repairs. 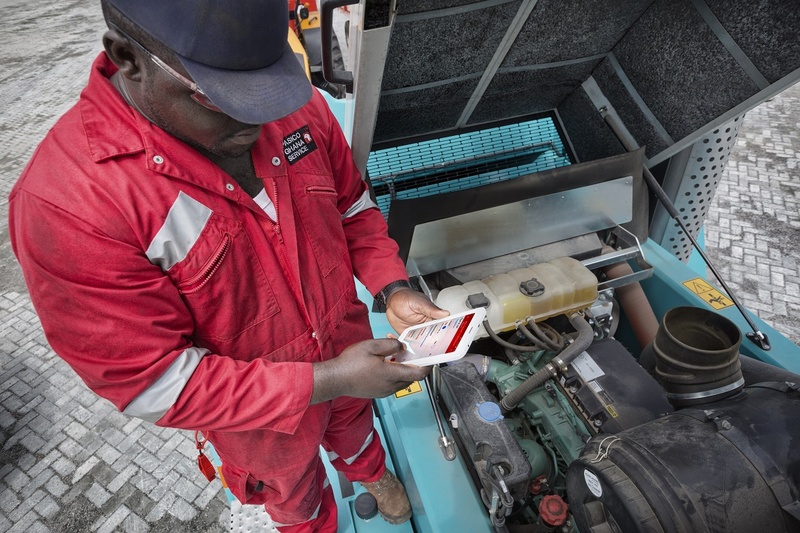 Technicians use image questions to document photographs and free text questions to note potential issues that may cause the customer a problem in two to three months’ time. Rather than waiting for a crane to break down and become inoperable, they can act to rectify issues immediately. Once a technician submits a form on their device, the logistics department is automatically notified and can instantly begin on the parts listing. “It’s given us a much better-presented report. And it adds value in terms of being able to start things and log them,” Traynor says. “That is a major project in itself.” For Paterson Simons, this means a quicker turnaround for service and parts delivery, further maximizing the customer’s initial investment. Professional, quality data display was an associated challenge for Paterson Simons. Serving as the face for a number of major heavy lifting manufacturers throughout West Africa, the company needed a solution that matched their commitment to first-class service. True to their quality policy, Paterson Simons technicians have earned high approval among fellow employees and customers alike. However, the company identified an opportunity for improvement when they considered just how often they were presenting solutions to business’ leadership teams (and the format in which they did so). “If you're submitting a bill for $6,000 worth of labor and you’ve got a scrappy, handwritten, one-page field service report, it doesn't really look like the customer’s getting value for their money,” Traynor says. Thanks to Device Magic’s ability to efficiently send data in a variety of tidy, polished formats like Word documents or custom PDFs, Paterson Simons has begun to submit more professional deliverables. “It presents us in a much better way. I think it enhances our commercial reputation,” Traynor adds. These quality formatting, upload and submission features have also made a difference among colleagues. Most of the company’s technicians are West African, and in many cases, they are assigned to sites managed by international expatriates. In such situations, factors like language barriers, cultural differences and varying management styles can create possible trust and communication issues. However, the managing director explains that Device Magic’s mobile forms and professional reporting have aided in mitigating potential confusion. “Having a very clearly written, very well-presented report removes those trust issues. So, that's one big bonus for us,” he says. Using mobile forms has not only helped boost sales and maximize service efficiency, but has also allowed Paterson Simons to create an open feedback loop within their data collection process. Since introducing Device Magic, the company has seen increased engagement both internally, among employees, and externally, within their customer base. For example, after receiving employee feedback about manual data entry challenges, Paterson Simons added a drop-down list of technicians’ names to their forms. Each name conveniently links to that technician’s email address, so a copy of their completed report is waiting in their inbox (in addition to those of the customer and head office). This quick and easy feature add has helped minimize data submission and transfer times, as well as prevented manual error. Paterson Simons has also made accommodations based on client requests and inquiries. When some customers hesitated to provide mobile signatures, for instance, the company introduced an option to automatically send printable copies of reports and invoices their way. “We set it up so that there’s a radio button that we can push, and the customer automatically gets a copy, which they can print out in duplicate,” Traynor explains. “It’s understandable because the customer wants to review exactly what’s been written before they sign the paper.” This demonstrated receptiveness, paired with the flexibility and customization possibilities of Device Magic forms, has largely benefitted the company and their client relations. The managing director goes on to say that the company as a whole has been pleased with the mobile forms app, as well as the ease with which they can create and format forms. He knows firsthand that having to depend on a third-party developer for changes and deployments can be quite difficult. “Whereas if it’s simply just your own IT department, it’s a couple of tweaks and off you go,” Traynor explains. “The great thing about Device Magic is that it’s reasonably sensible, and it is possible to develop an app-in house. I think it’s been a great bonus for us,” he says. Thanks to the fact that their employees have so openly embraced Device Magic, Paterson Simons has started expanding their use cases for mobile data collection. “We haven’t just used it for field service reporting; we’ve actually realized we can use it for gathering all kinds of information from our team,” Traynor adds. For example, those employees using company vehicles submit monthly mileage and condition reports via mobile forms. In addition, service employees perform pocket risk assessments to review fundamental hazards before beginning a new job. When it comes to review and assessment, the managing director explains that he can easily log in to his Device Magic dashboard, select a group of reports and download them into Excel. “Then, we have a proper way of reviewing, rather than just looking at handwritten documents, one by one,” he summarizes. What was once a significantly painful process for the company’s various teams is now smooth and effective. Mobile forms have proven to be an invaluable tool for Paterson Simons’ heavily lifting equipment sales and maintenance in a variety of ways. Since their introduction, Device Magic’s forms have provided deeper insight into remote job sites, ensured accurate records, and increased invoicing and processing speeds. 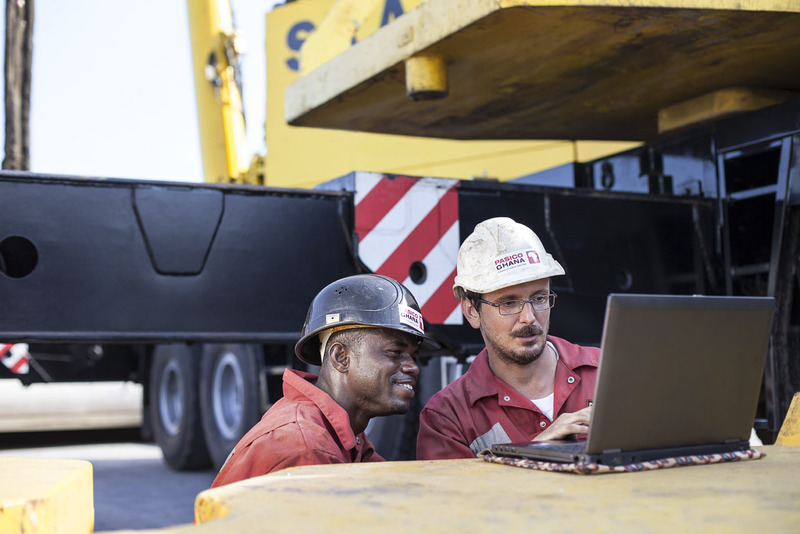 They’ve also optimized data display, minimized manual data entry challenges and delivered first class service to customers in the heavy lifting industry throughout West Africa. Finally, both internally and externally, they have sparked engagement, as well as contributed to a professionally enriching, communicative and flexible environment. Paterson Simons looks forward, continuing to expand and identify ways to incorporate mobile forms into their day-to-day. “We’re very happy,” Traynor exclaims. “We’re now developing an app across the board so that all the vehicle users, sales guys, as well as service guys can use it on their phone.” Wherever they go, Device Magic plans to support them.